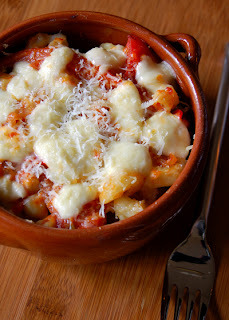 Katie over at Other People's Food shares this recipe for Baked Stuffed Pasta. The secret ingredient is tofu. Shhhhhh....don't tell anyone and even those who usually turn their noses up at the thought of eating tofu will be licking their plates. 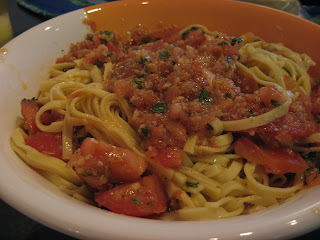 My cousin Ar doesn't have a blog, but that hasn't stopped her from making great pasta dishes like this Bruschetta Linguine. Breadchick at The Sour Dough has no kitchen during the week and still managed to come up with this awesome looking Shrimp, Mushroom & Pea Pasta. Who knew the microwave could produce something so wonderful! 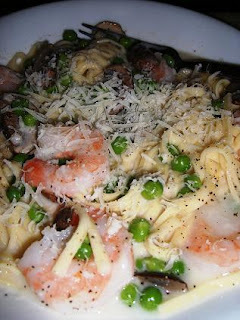 Judith at Think On It is back and this time shares a mouth-watering Shrimp & Lemon Pasta dish. 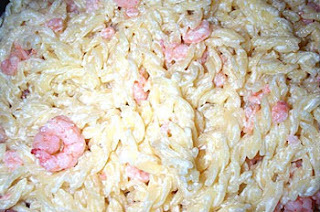 Check out all the cute little baby shrimp hiding in the pasta. She also had a post with about a million pasta shapes for us to think about. And another Judith, this one of the special Aroma Cucina is back too. 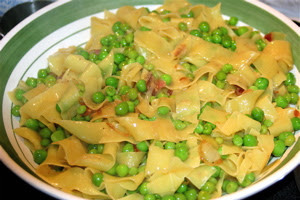 She shares her favorite Spring Pasta Con Piselli Primavera. Who could help but smile at those gorgeous green peas! Can you tell Spring has finally Sprung? 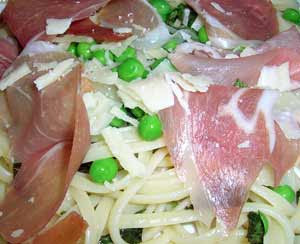 Abby of Eat the Right Stuff is also using peas in her terrific looking Linguine with Peas and Parma Ham. 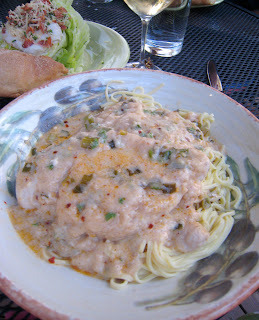 S'kat of S'kat and the Food shares her sister-in-law's Spicy Chicken in White Wine Sauce over fresh pasta. We should all go and visit her! The dinner was a huge hit. No surprises there! Myriam of Once Upon a Tart hasn't missed a Presto Pasta Night yet and I for one am truly grateful. 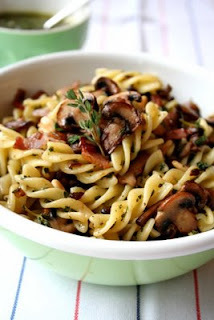 Her dishes are awesome and this Mushroom & Pesto Pasta Salad is no exception. Keep them coming! 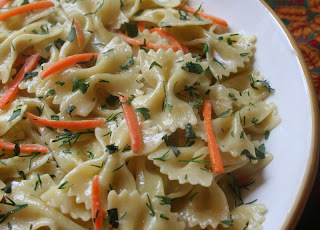 Sher of What Did You Eat is back with the prettiest Farfalle with Carrots & Herbs. She was tempted to make the Martha Stewart Living recipe for carrot pasta and came up with this instead. 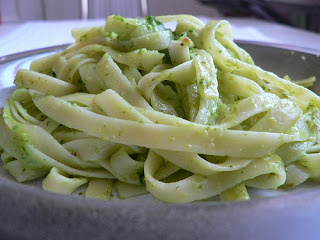 Ulrike of Kuchenlatein is back (or should I say her first born) with this simple but so tasty looking Tagliatelle with Ramson-Almond Pesto. I love new discoveries and now I have to hunt for Ramson. Haalo of Cook (Almost) Anything is back too. She always brings something fun to the table. This time it's Baked Succhieto with Peperonata. 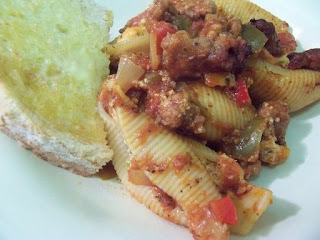 She's happy for cooler weather to enjoy this hearty dish. I, on the other hand, need it for the prolonged cold spell we're having here. 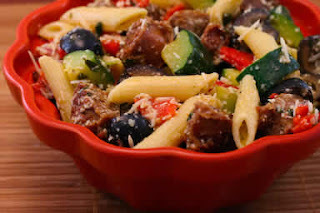 Kalyn over at Kalyn's Kitchen visits PPN for the first time and shares this festive and very South Beach Diet friendly Sausage, Zucchini &Pasta Salad. Don't you just hear the Mariachi Band in the background? I do! 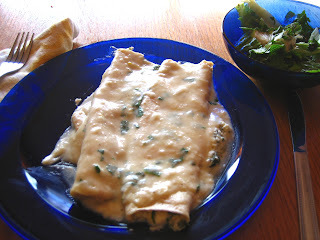 My dish - Spinach & Quark Cannelloni with Bechamel Sauce is also South Beach Diet friendly even if it looks (and tastes) like it has a million calories per bite! 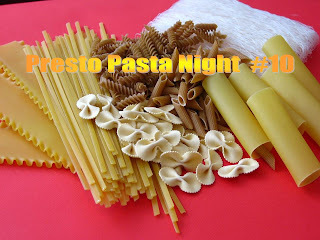 I will be adding late additions to this week's Presto Pasta Night until Saturday. Any I receive after that will be part of next week's PPN Event. So don't forget to join the fun. Sra from When My Soup Came Alive is a first time visitor to PPN and I couldn't wait to share this really interesting Pepper Paneer Pasta. It may look bland, but it certainly sounds intriguing. Remember that ALL noodles dishes count as pasta for this fun event. Find out how to participate here. In the meantime....Happy Pasta Eating!!! Delicious, every single one! Can't wait to try yours Ruth, looks great. 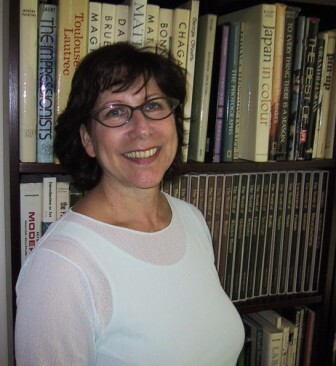 Thanks for the great round-up. So many good pasta ideas! 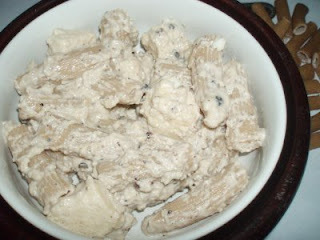 And yet there's even MORE fantastic pasta dishes to salivate over! So glad everyone is enjoying PPN as much as I am.